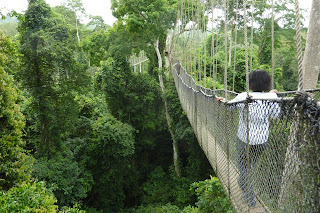 How dare this impending thunderstorm ruin my morning on the forest canopy, I thought when I woke up next to my laptop, which was perched on top of a hotel Bible in the Mighty Victory Hotel in Cape Coast, Ghana. But the front desk clerk was more optimistic. "I think it will clear up," he said. I asked him to find me a taxi. It's not impossible to get to Kakum National Park on public transportation—it's only 35 kilometers away—but it takes work. 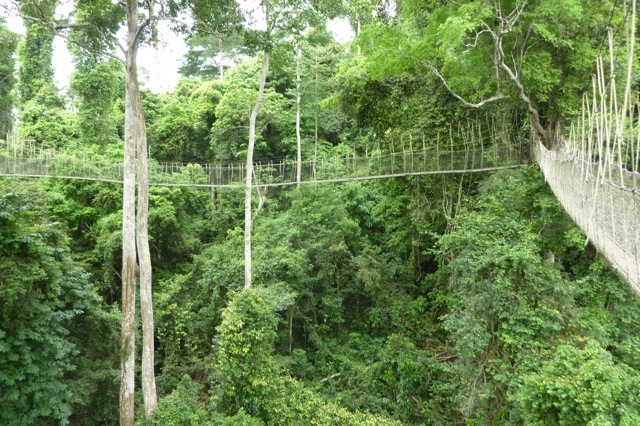 Namely, at the end, when you have to get from the nearest road to the gate to the headquarters for the canopy walk. I didn't have time for all that—I wanted to get to the mall at Accra tonight to buy sandals. My heel melted on a motorbike exhaust pipe back in Djenne, Mali, and I'd been ignoring the damage ever since. But my shoes had seen better days, certainly. I didn't know how long they'd hold out before my right foot started to hurt. But then, it hadn't hurt yet. Maybe I was overreacting to having a melted sandal heel. And anyway, Accra is only two-and-a-half hours away from Cape Coast. I might just be getting a taxi because I'm lazy. The hotel clerk found me a perfectly pleasant taxi driver with a working taxi, and the rate is the same for all of them (40 cedi), but I did have to pay one more cedi at the gate to get the taxi in and then ten more admission at the park office. I was given a badge on a string to wear around my neck, and pointed over to a bench under a tree. "Wait here for your guide." 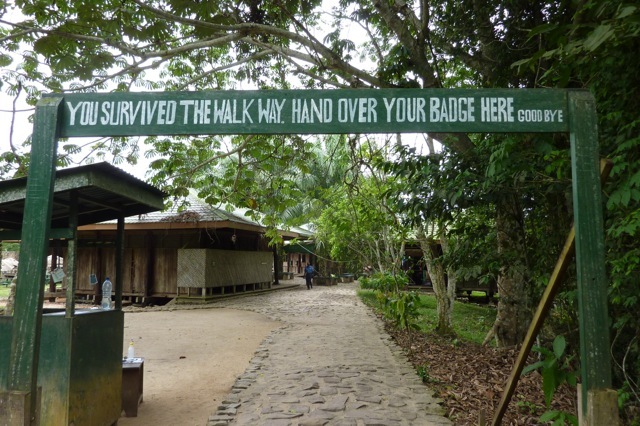 So I did, wearing my badge under old trees that shaded a souvenir shop and park headquarters. 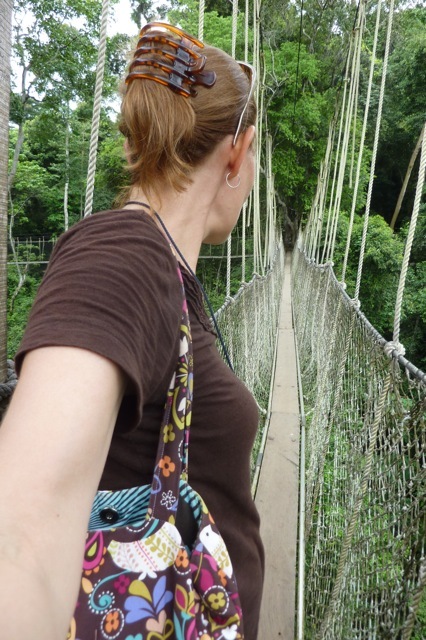 I watched school kids in uniforms run in and out of the bathrooms, and waited for the other tourists who would be going up on the canopy walkway with me. Six more showed up, including a single man, a couple, and two parents with their teenage son. A female guide in a neat skirt showed up. "Do you all have your badges?" Up, up, up. The trail was dirt and occasionally gravel, and the guide led us up it, so that we were starting pretty high up before we got our first look at the canopy walkway. "Here is your walk." She pointed at a series of horizontally hanging ladders covered in planks. 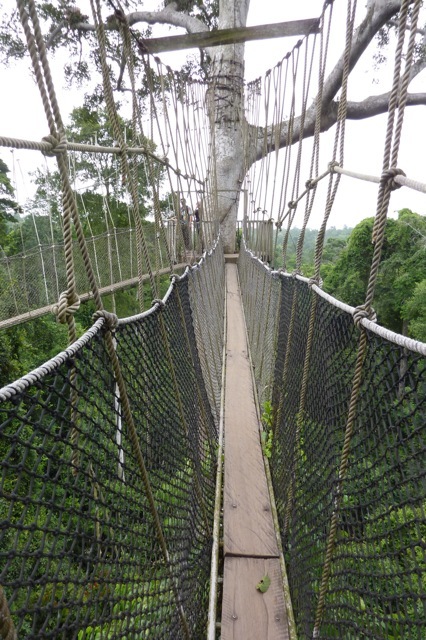 Knots, steel cables, and nets were on either side of and beneath the walkways. Oh my. That? We walk on that? "It is normal for there to be some swaying. Please do not be alarmed. That way, to the left, is the short way. To the right is the long way. The second person should not start until the first person is halfway across. 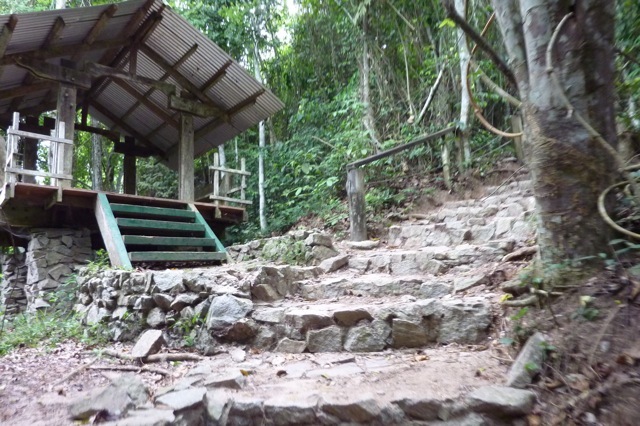 At the highest point, you will be 40 meters above the forest floor. You will not see any animals—they come out at night. I will meet you on the other side." The family went, each waiting for the other to go halfway before starting. Then, the woman in the couple hesitated. "Which way is the short way?" "It's left," I reminded her. "But you only get to do this once. You might as well go the long way. Either way, it's scary." She took a deep breath and bravely headed right. I headed right as well, but without hesitation. This was actually fun. I don't do so well with things involving bungees or risk of physical damage, but this looked just scary enough to be enjoyable, but not scary enough to be terrifying. The walkways shake and jangle just a little as you go. I wanted to shoot video, but I really did need both hands to hang on and balance. The walkways have little platforms in between, built into the trees, so you can get your bearings if you're starting to feel off-balance. I had nearly passed by without trying this, because initially I had thought it would be too difficult to get here. It had been a cinch and walking up here in the trees, in near-silence, was a wonderful way to spend the morning. Too soon, we were at the finish and back on solid land. I left five of the six behind and followed the single man back to the trailhead, where we turned in our badges. Then, back in the taxi to Mighty Victory. "I'll just go in and get my bag, and then can you take me to the bus?" The taxi driver conferred with the hotel owner, who had come out into the parking area. School holidays were on, which meant I couldn't just expect to breeze onto a bus. It would be sold out. "I think the Ford drivers go too fast," said the hotel owner. "But in this case, you would be better taking a Ford. They leave all the time." Indeed they do. I had to wait only ten minutes before I was loaded into the white van for the 2.5 hours to Accra. What I hadn't counted on, though, was the next hour of sitting in traffic once we arrived in Accra and I got into a local taxi. ARGH. Hell traffic, from one end of town to the other. I'd tried to book a hostel near where the buses and Fords arrived, but it hadn't had room. Fine. I'll get a nice hotel then. I bossily gave the taxi directions based on having studied Google Maps and the guidebook. Miraculously, he bought my act and took me to the right place. 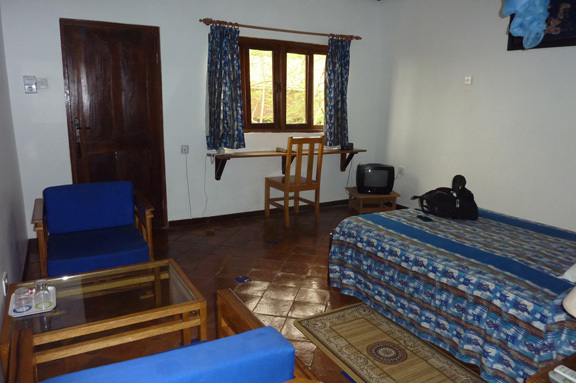 I checked into Afia Village. I didn't get a beachfront room, but with the A/C, working wi-fi, and hot water, I wasn't complaining about my lovely digs. Lovely costs, of course, but I'd worry about running though my year's budget in three months later on. I peeled off and rinsed out my T-shirt in the bathroom sink, turned on the air-con, and sunk into a padded chair in my room. Ah, this was nice. Remember when I vomited at the end of the day's journey twice at the beginning of the trip? So glad that part is over. And after a quick shower, I headed out to the mall in a taxi. 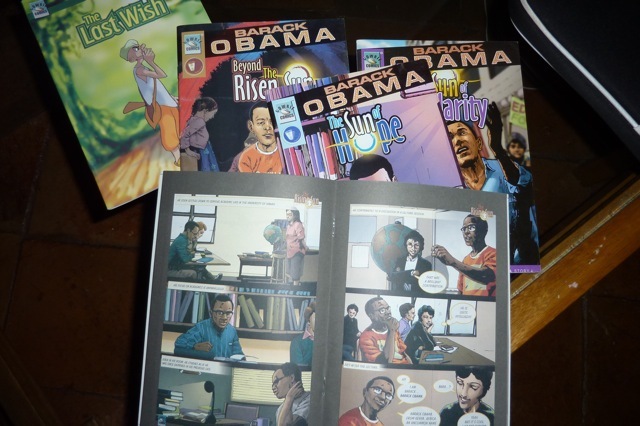 The mall had a pseudo-Apple Store, a store selling only Puma products, and a bookstore selling Nigerian comic books ("Literamed") about the life of President Obama (I briefly contemplated e-mailing the comic company about suppressing ink limits, but decided they wouldn't appreciate my nosiness). Young men in the mall asked me to pose for photos with them (too late, the taxi driver told me they use these in confidence scams), and I tried on purple-and-brown Birkenstocks. I drank iced coffee and bought a few souvenirs in the GAME store (which is like an African K-Mart), but nowhere in this pleasant shopping mall did I find the right sandals. The melted heel will continue along with me to Cape Town, then. I flagged down a taxi and went back to Afia Village to use their wi-fi to catch up on some work. I'm still working, but it's harder and harder as my connections get worse and as I become more exhausted. It looks terrifying to me! Maybe I've seen too many adventure movies involving frayed or cut ropes.